This page contains news for the Injustice 2 Ultimate Edition copy for Injustice 2. Here you’ll find the latest news in regards to the different details for Injustice 2 and the different editions of the Injustice 2 console game copies (Standard, Digital Deluxe and Ultimate Edition). For more Injustice 2 content, head over to our Injustice 2 top page. There will be at least three versions of the game: Standard ($60), Digital Deluxe ($80), and Ultimate ($100). The Digital Deluxe edition comes with three DLC fighters and one premier skin. You can transform your Super Girl into Power Girl. With this premier skin she has a new look, voice, and dialogue. In addition, an additional gear shader pack is included if you will be getting the deluxe edition. The gear shader that is included is the gods shader pack which enables you to customize the look of your entire roster. However, The Ultimate Edition comes with nine DLC characters and three premier skins. These premier skins are available for The Flash, Green Lantern and Supergirl. You will be able to transform the 3 characters into Reverse Flash, John Stewart and Power Girl. These premier skins give them a new look, voice and dialogue. Unlike the Digital Deluxe Edition, the Ultimate Edition includes all 3 premier skins plus 2 exclusive gear shader packs which are the gods shader and the demon shader packs. It is highly recommended to get a copy of the Ultimate Edition to be able to enjoy to the fullest the capabilities and new features of Injustice 2. 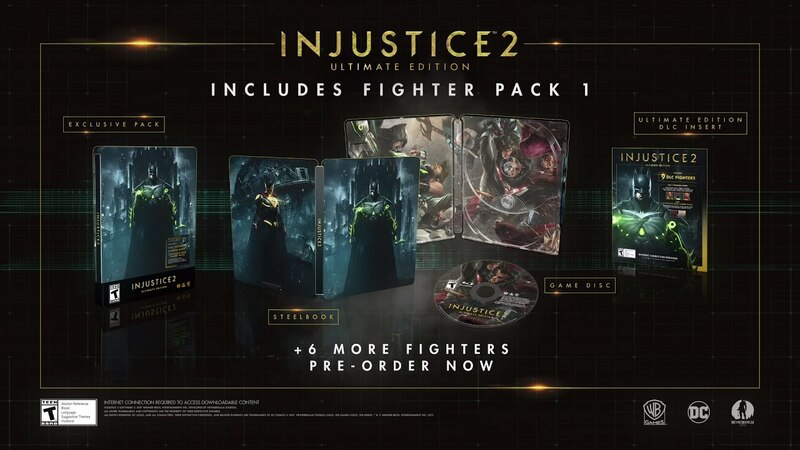 In addition, being able to purchase the Ultimate Edition gets you early access to exclusive content (much like the premier skins and the DLC characters) as well as a glimpse to be able to use Darkseid as well.